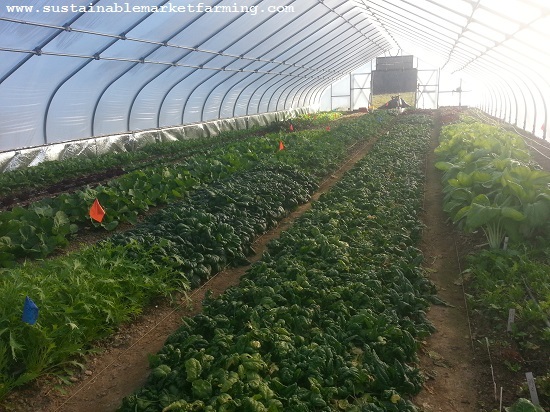 Here’s an end-of-year pictorial post with photos from our hoophouse through the year. Few words! Enjoy your holidays. Maybe Santa will bring you a hoophouse? January spinach from our second sowing. 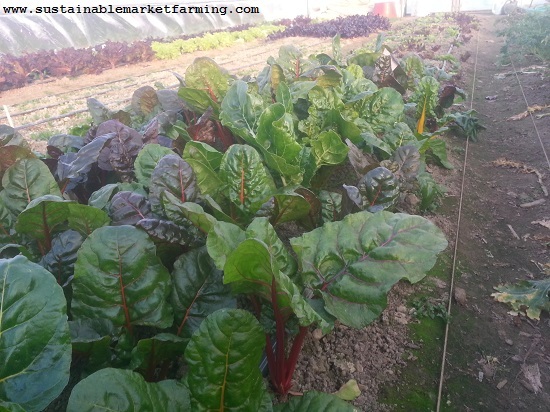 Hoophouse Bright Lights chard in February. Hoophouse beds, marking spots to transplant tomatoes in mid-March. 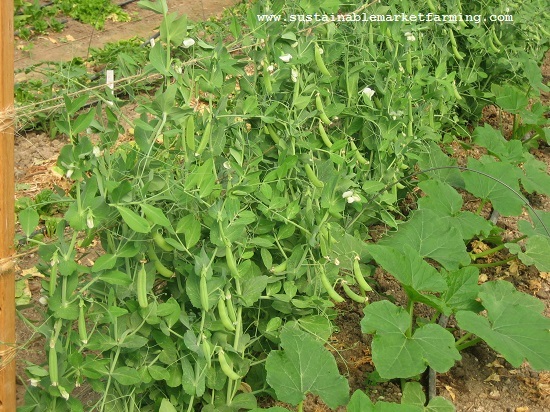 April snap peas with young squash plants. The snap peas in May. 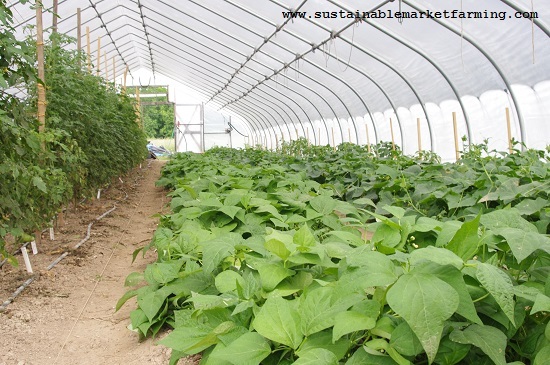 Tomatoes, green beans and cucumbers in June. Tomatoes, yellow squash and more tomatoes in July. 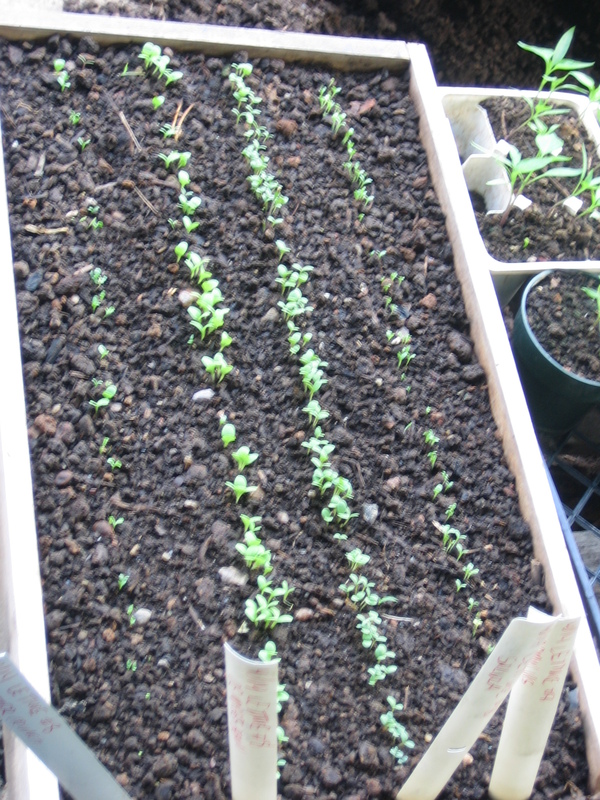 Radish seedlings on September 25. 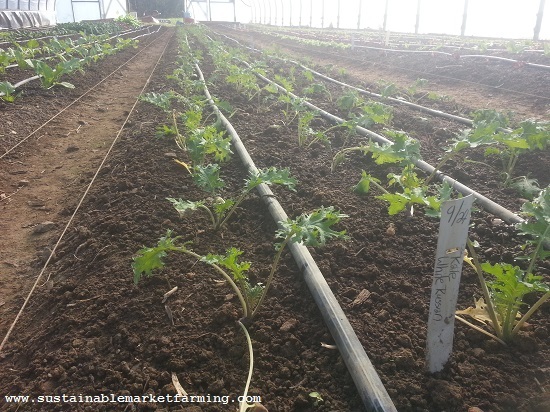 September sown White Russian kale (transplanted in October). Tokyo bekana and spinach in October. 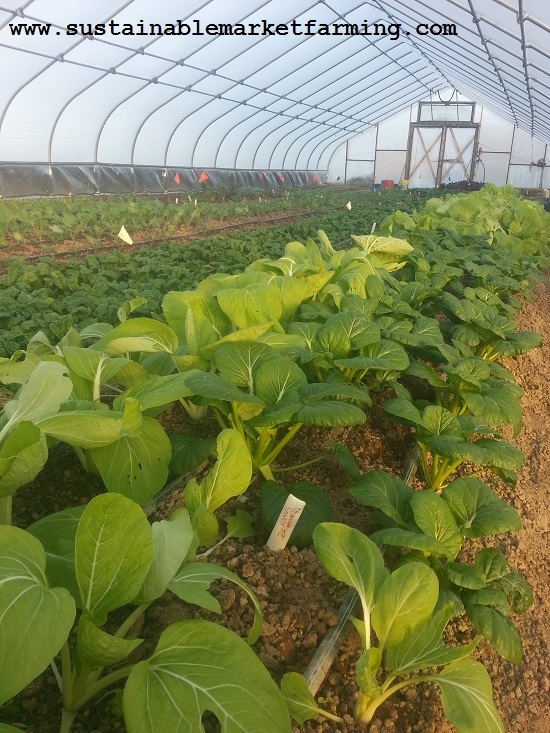 Young pak choy in November. Tatsoi in the mist, November. 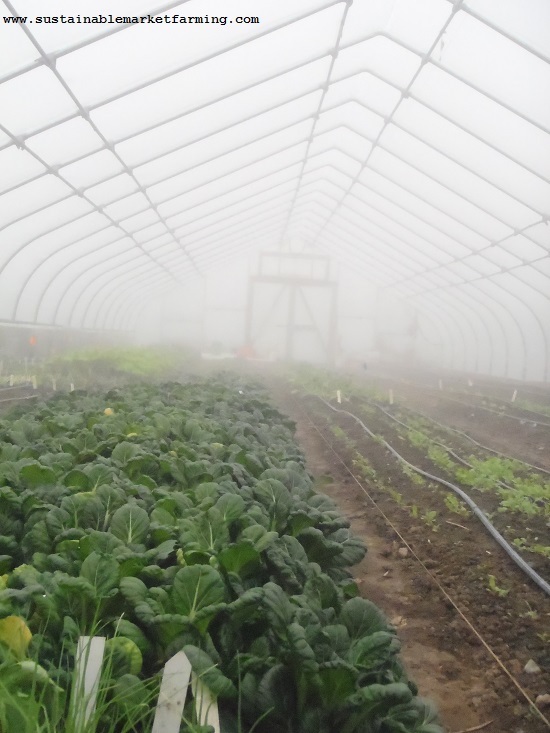 View through the hoophouse doors in December. Hoophouse tomatoes and squash, garden tour, class. We have planted our two beds of tomatoes in our hoophouse – 92 plants – can’t wait! It will be the very end of May before we get any to eat. We have one bed of fast-maturing kinds, mostly Glacier and Stupice, but also a couple each of Five Star Grape, Sun Gold, Atkinson (trying this for the first time), Garden Peach, Mountain Magic, and Ozark Pink (first year for this too.). Except for Atkinson and Ozark pink these are all tried and tested here. They all mature in 56-71 days from transplanting. 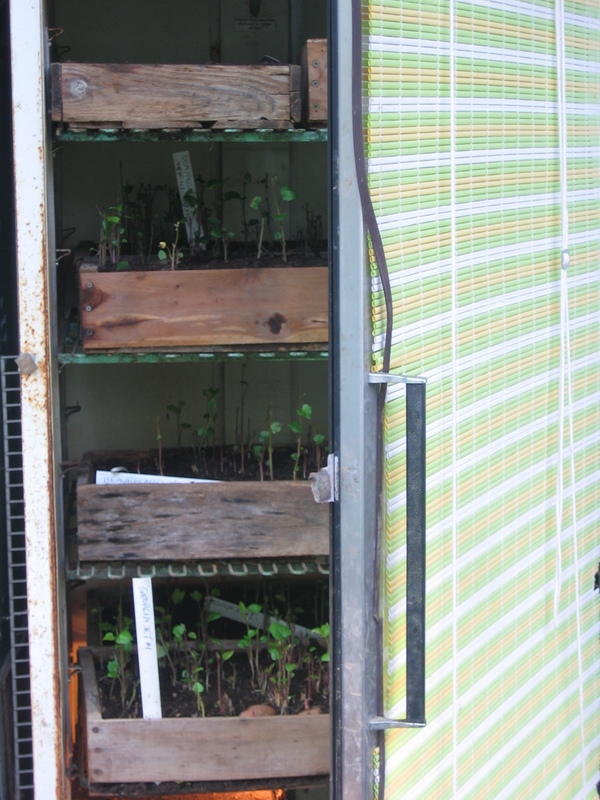 Our second bed is of slower ones – 75-85 days from transplanting. A quarter of them are our reliable standard red slicer Tropic. About another quarter are our favorite orange slicer Jubilee. The other half of the bed are special ones, such as Yellow Oxheart, Amy’s Apricot, Black Cherry, Vinson Watts (new to us this year, disease resistant), Green Zebra, Amy’s Sugar Gem, Rebelski (new to us), Mortgage Lifter, TC Jones and Striped German. For the tender crops going into the hoophouse at this time of year, we don’t clear the whole bed, but dig holes at 2ft spacing down the middle, removing winter crops as needed. Holes dug for our hoophouse tomatoes. After planting, we prioritize harvesting the old crops directly to the south of the new plants, then gradually harvest the other “old” crops around , to make more space for the growing new crop. This way, we get maximum food from the space. When the surrounding “old” crops are big, we also get some protection on chilly nights. 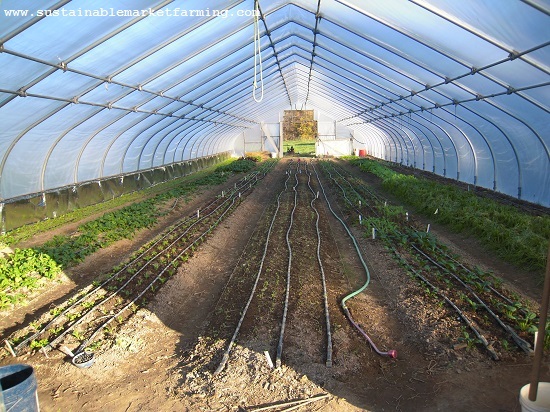 As you can see in the top picture, we also put wire hoops over the plants and use row cover if a frosty night is forecast. Summer squash in the hoophouse, planted among Bulls Blood beets. Next to be planted is a row of squash. Today the plants are still in a flat in the greenhouse. Next weekend is forecast to be cold – below freezing. Do we plant soon and add row cover, or try to wait until after the weekend? By then the plants could be too big for the flat. Today I gave a garden tour to 15 horticulture students from J Sargeant Reynolds Community College, one of Betsy Trice’s three classes there. On Saturday I taught a class at New Country Organics in Waynesboro, on Succession Planting. I have many slideshows, and each time I prepare for a presentation I usually revise or at least tweak the one I’m about to give. And often after the event, I upload the slides to SlideShare.net so people can see them again (or the many people who missed the event can see them for the first time. I haven’t yet uploaded the slightly revised Succession Planting to Slide Share. I see I posted the previous version here as recently as 11/10/15. Instead of reposting I went through my archives and made a new category “slide shows” and labelled all the ones I could find. So, if you are in a slide show watching mood, you can click on the Slide shows category in the side panel on the left and pick from the choices there. Also, Jillian Lowery filmed the class at New Country Organics, and I hope to be able to post the video. Rhubarb in early spring, not yet ready to harvest. Outdoors, we are weeding, composting and mulching our rhubarb. This is a borderline climate for rhubarb, but we manage to get a crop from it. Best if we provide summer shade. Author farmerpamPosted on March 28, 2016 March 28, 2016 Categories Events, Slide shows, Sustainable vegetable production, This week in the gardenTags Amy’s Apricot, Amy’s Sugar Gem, Black Cherry, Bulls Blood beets, Five-Star Grape, Garden Peach, Glacier, Green Zebra, hoophouse, J Sargeant Reynolds Community College, Jillian Lowery, Jubilee, Mortgage Lifter, Mountain Magic, new category "slide shows", New Country Organics, Ozark Pink, Rebelski, rhubarb, row cover, SlideShare.net, squash, Striped German, Stupice, succession planting, Sun Gold, TC Jones, tomatoes, Tropic, Vinson Watts, Yellow Oxheart1 Comment on Hoophouse tomatoes and squash, garden tour, class. The August issue of Growing for Market magazine is out (the June-July issue was the most recent previous one). This one includes my article on Last Chance Sowings. In line with my advice, at home we are busy preparing beds and sowing beans, bulb fennel, cucumbers and squash. 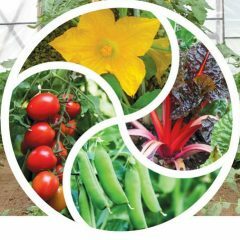 As well as being our last chance with these warm weather crops, it’s now our first chance to start again with the spring and fall crops such as carrots, beets, kale, scallions, turnips (no rutabagas for us these days – it needs extra time to grow to a good size, and we’re never ready soon enough). 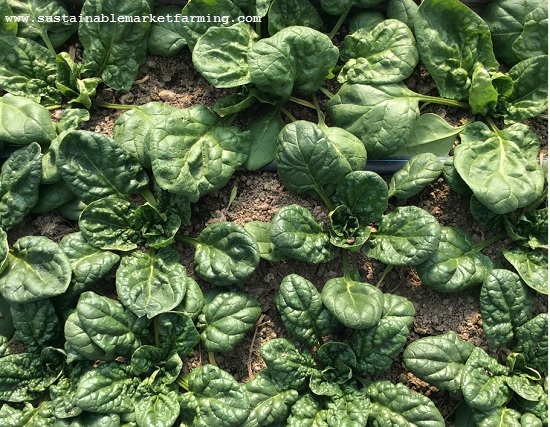 It’s too soon for us to sow spinach (although the weather is surprisingly cool for August!) 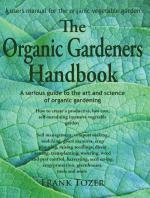 – we wait till the fall chickweed, dead nettle and henbit germinate before sowing spinach. we’re also out in the garden every evening transplanting broccoli and cabbage. We’re over half way, and the mild weather is really helping. 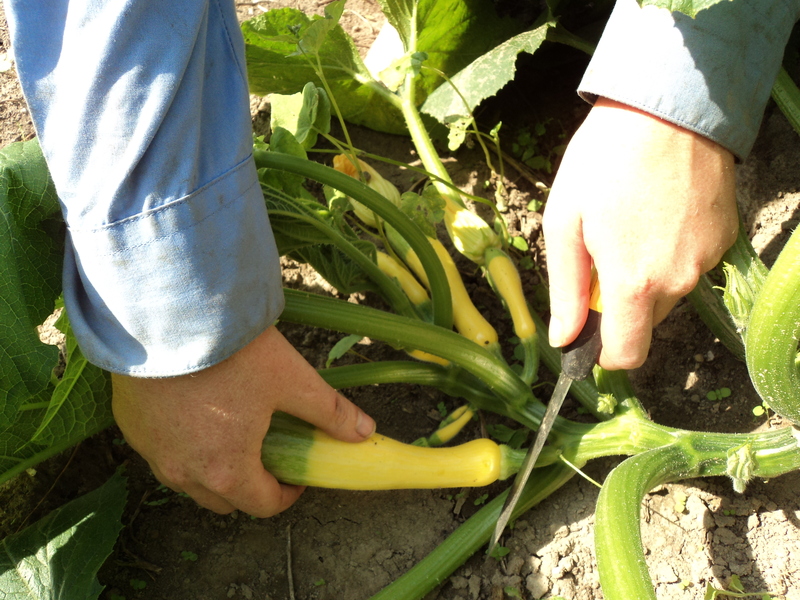 Cutting Zephyr yellow summer squash. 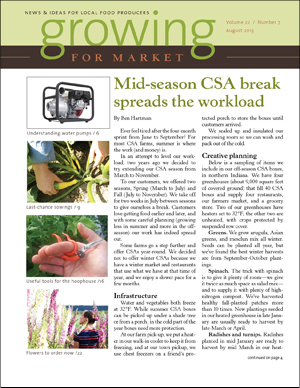 Also in this Growing for Market issue are valuable articles by other growers, such as Ben Hartman on arranging their farm’s CSA into two separate seasons, spring and fall, with a two week gap in the middle. What a great idea. I got a two week gap myself, thanks to our stalwart crew keeping the crops happy while I was gone. There’s encouragement from Lynn Byczynski, the editor, to comment to the FDA on the proposed food safety rules for produce. 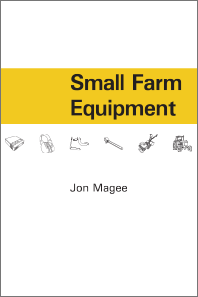 Jonathan Magee (author of the book Small Farm Equipment) writes about irrigation pumps, which will likely be a big stress-saver for anyone who has stood in exasperation over a non-working pump. Andrew Mefford writes about useful tools for the hoophouse, including some nifty little Harvest Scissors, worn like a ring, freeing up the hands to alternate with other tasks while working.Erin Benzakein, the regular writer on cut flowers, covers ideas for early spring blooms, and, as always, has some beautiful photos. For the next issue I am writing on strawberry production systems, including our latest method – using landscape fabric with holes burned in it. My presentation on Planning Fall Crops at the Virginia State University Commercial Berry and Vegetable Field Day on June 27 is now a full blown video. you can view it at their website, along with those of the other presenters; Reza Rafie on specialty crops such as baby ginger, Steven Pao on food safety and Debra Deis from Seedway Seeds on their variety trials. Talking of irrigation, It’s time I left my desk and went to switch over to today’s fourth sub-system. Here’s the presentation I gave at the VSU 2013 Commercial Berry and Vegetable Filed Day at Randolph Farm, Petersburg on Thursday (6/27). Actually this slide show has some extra slides that I had to cut out to fit the time available. Registration for the field day had doubled compared to last year and reached 500. I don’t know how many were at the presentations, maybe 250. The other option was to continue the outdoor exploration of the research plots. for a video compiled by Michael Clark, combining my slideshow and me speaking. Our sweet potato plot doesn’t look like this yet. We’re weeding as the vines start to run. Meanwhile, back at the farm, I’m sowing fall broccoli, cabbage and senposai, weeding sweet potatoes, sowing another succession of beans and one of edamame. More of our time is spent harvesting these days. Today we pulled a bag of beets, 2 buckets of beans, 2 buckets of lettuce (we’ll have a short gap until the next bed comes in), 6 buckets of broccoli, one bucket each of cukes, squash, zucchini, turnips and kohlrabi. 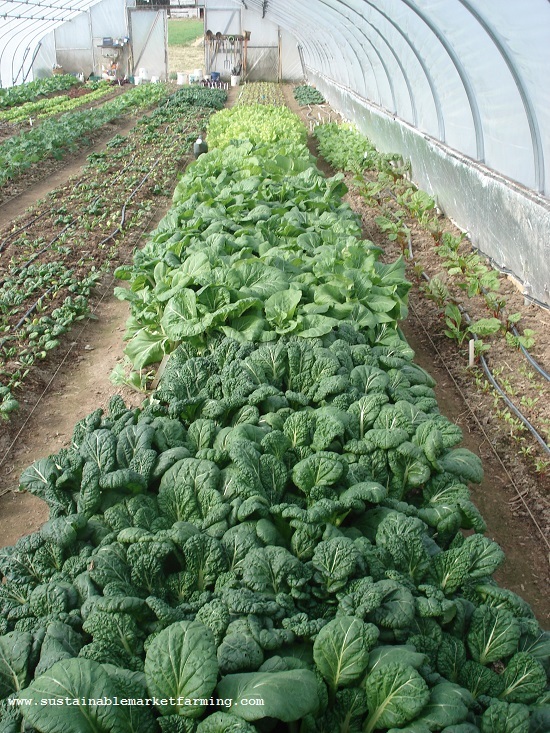 Most of our crops are getting harvested every two days at this point (except lettuce, cukes and zukes). So no cabbage, kale, chard, scallions, blueberries or celery today. 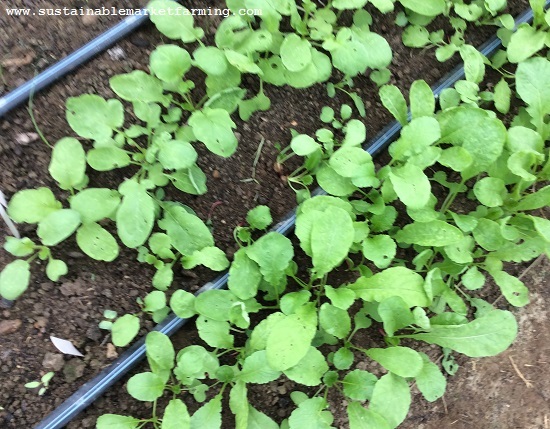 Turnips interplanted with radishes – two spring crops from one bed. 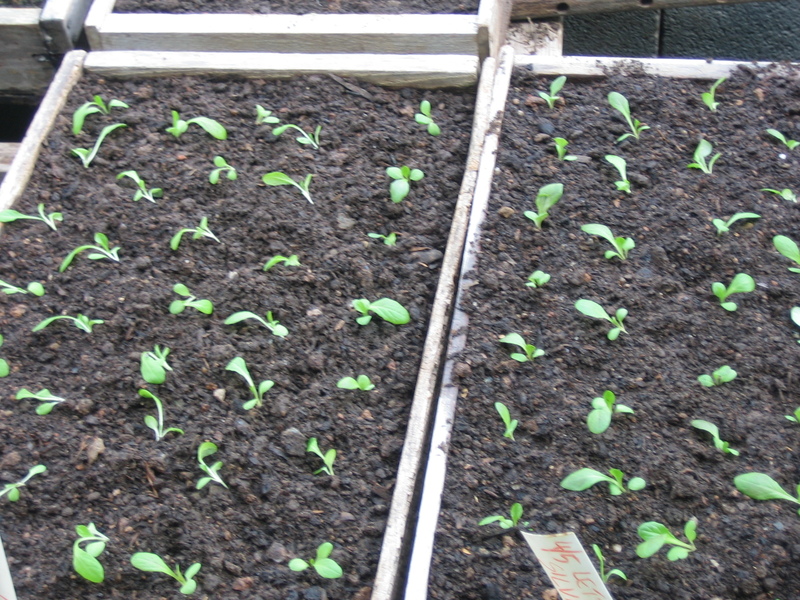 Lettuce Factory: Sow heat-resistant lettuce outdoors, every 8 to 6 days, #10, 11, 12, 13, 14. Transplant 120/week (1/3 bed). #7, 8, 9, 10, 11 this month. Deal with potato beetles with Spinosad [or Neem] once larvae are seen, if >50 adults/50 plants or >200 larvae/100 plants. Spinosad: Spray when bees not flying (early morning or late evening.) Shake well, 1-4 Tbsp/gall. Expect to need 1.5-2 hours and 9-10.5 galls. Clean and triple rinse the sprayer. Do not flush in creek or pond. 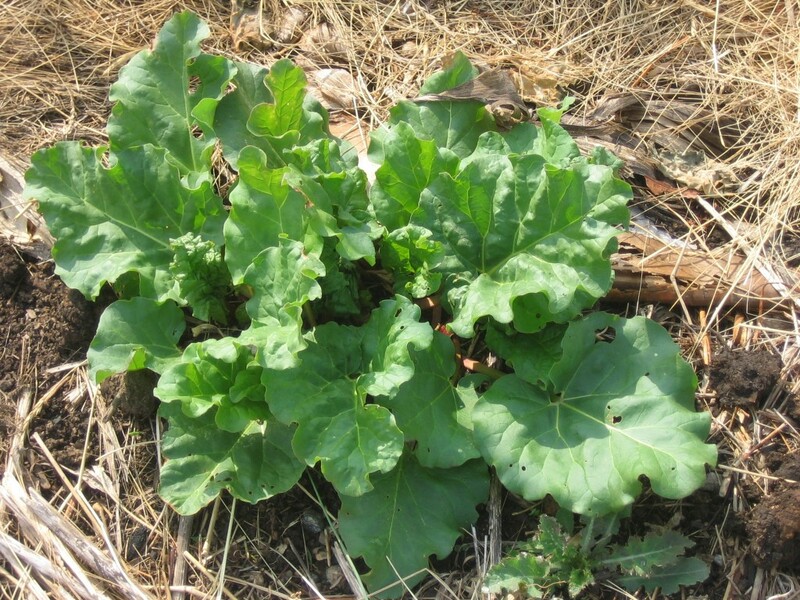 Repeat if needed in 6-7 days – could spot spray where larvae are seen. Flame weed potatoes before 12” high, if needed. Deal with asparagus beetles, if necessary. See notes under April. 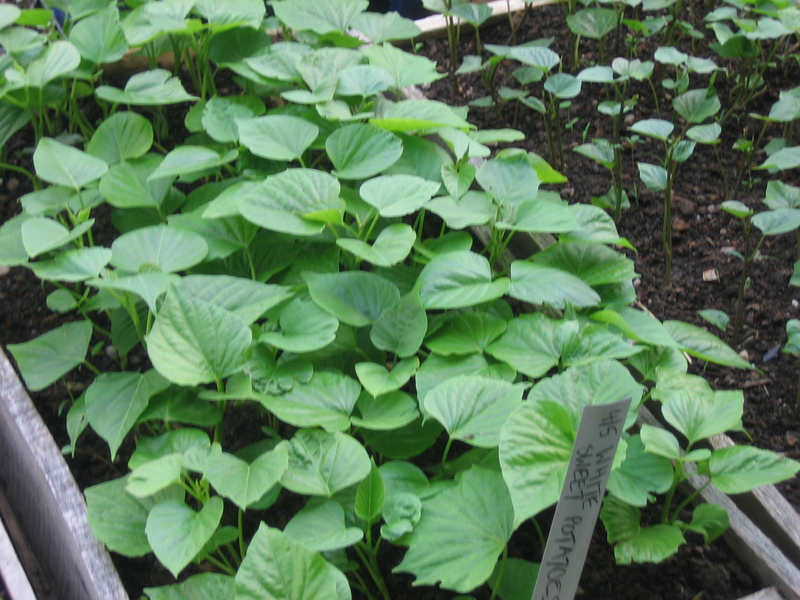 Flat of home-grown sweet potato slips. Continue cutting sweet potato slips until we have enough. Transplant when hardened off: celery, celeriac, lettuce #7, main tomatoes (2’). Set out drip tape & bioplastic mulch , transplant Romas (2’), peppers (18” when soil 70°F, dogwood blooms dropping), hot peppers, and melons #1, sweet potatoes. 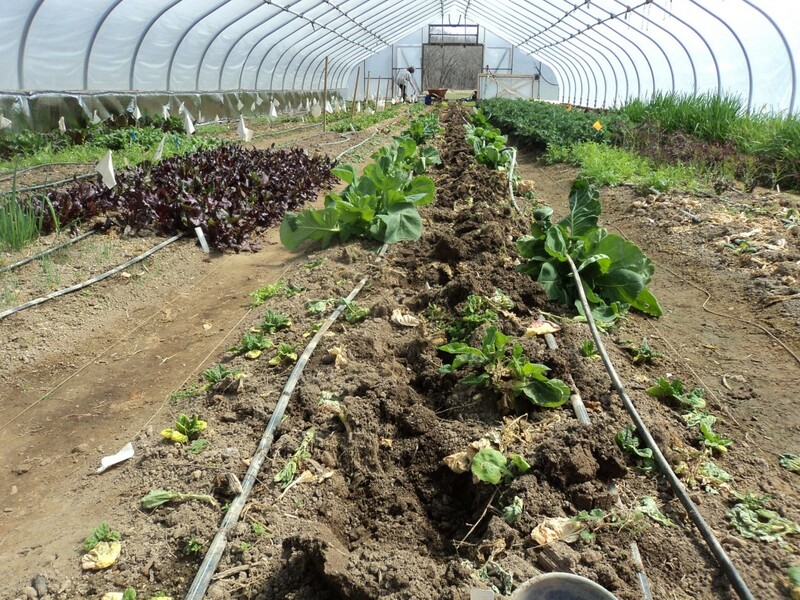 Roll out driptape and bioplastic mulch for watermelons. Cover Crops: Sorghum-Sudan, soy, buckwheat, or pearl millet as summer cover crops, now frost is past. 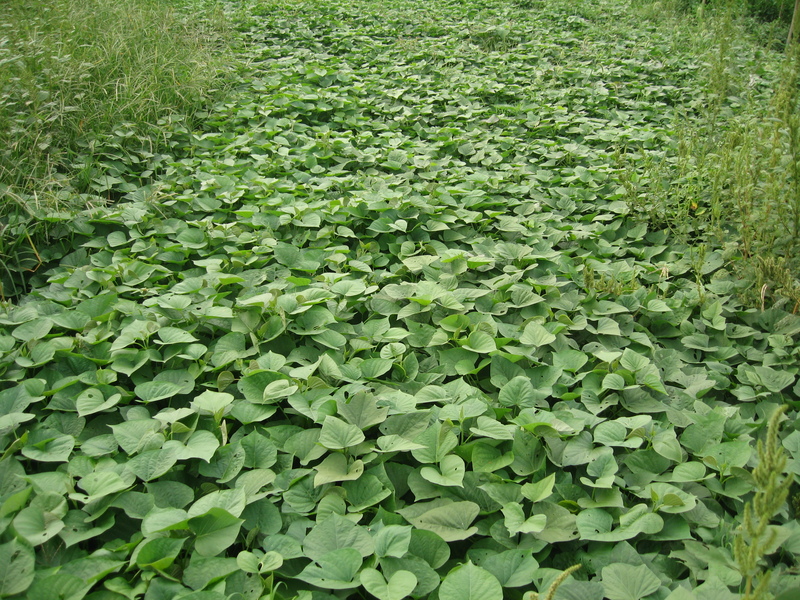 Plant sweet potatoes, 16″ apart, with 4-4.5′ between ridges, 5’ at edges of patch. 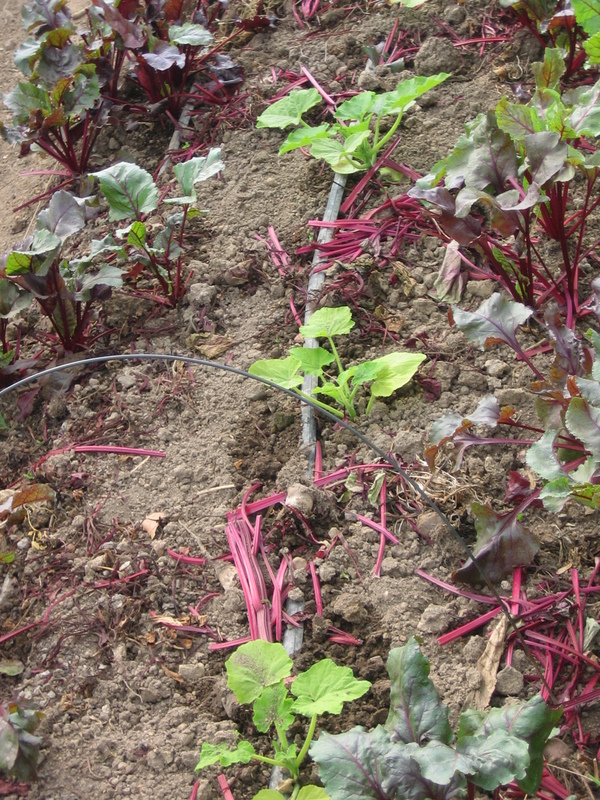 Install drip irrigation on ridges and plant at every other emitter. Ideal if soil temp is 65°F for four consecutive days before planting. If weather dry, dip roots in mud slurry before planting. Plant 2-3” deep, with at least 2 nodes in ground, and at least 2 leaves above ground. 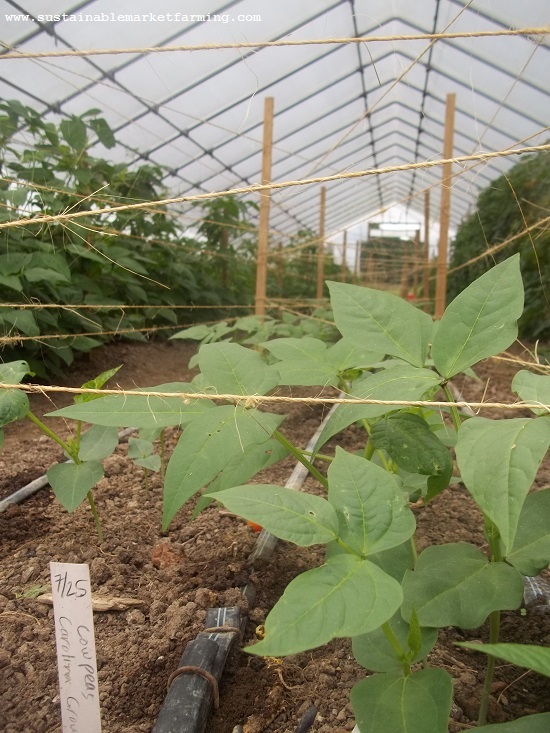 If slips are long, plant horizontally to increase production. 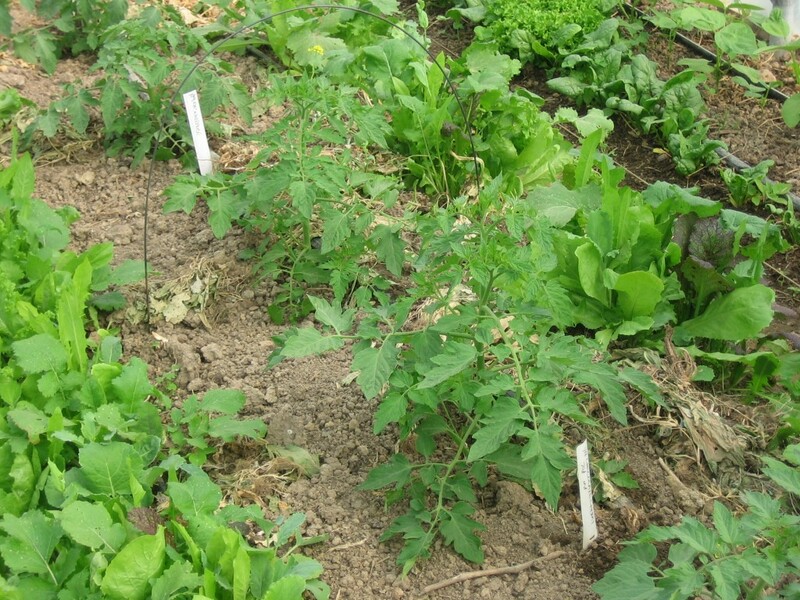 Transplant lettuce #8, eggplant (2’ apart, single row in center of bed, spray off flea beetles with jet of water & cover immediately), watermelon, insectaries, (okra if not direct-sown – mulch later, when soil warm). Set out drip tape and biodegradable mulch and transplant melons and watermelons at four weeks old max. Cover for 3 weeks. Move rowcover off broccoli (12 pieces) and strawberries (~8 pieces) Watermelon needs 12 pieces. 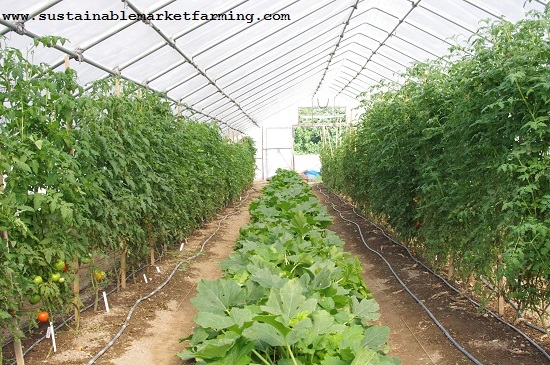 In greenhouse sow tomatoes #3, filler watermelons & Romas. Sow cukes & squash #2 if spring is late and cold, and direct-sowing not wise. Sow beans #2 (5/14, 28 days after #1), edamame #2, carrots #6, sunflowers. Till between rows of corn #1 & transplant in gaps and/or thin to 8”. A bed of various varieties of onions. Weed onions 3 weeks before expected harvest date, and broccoli. Garlic: Harvest garlic scapes, remove mulch from garlic, and weed. Move mulch to weeded broccoli. Check maturity of potato onions and garlic. Likely harvest order is fall potato onions 5/25-6/10, hardneck garlic 5/30-6/15, spring potato onions 6/3-6/18, bulb onions 6/11-6/30, softneck garlic 6/5-6/15. #4 Spring Tractor Work mid-May – Disk areas for June potatoes, corn 3,4,5, & later succession plantings of beans, squash, cucumbers. 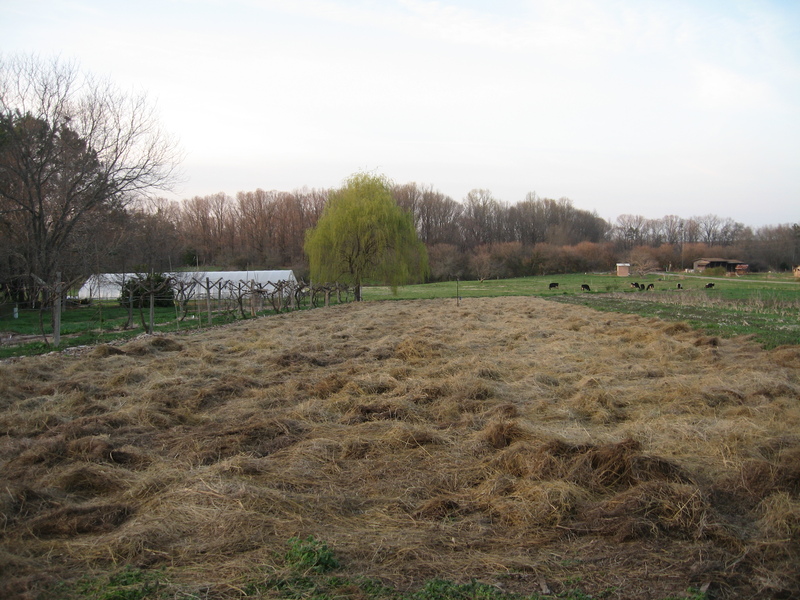 Mow between no-till paste tomato rows before mulching with hay. Fill gaps, weed, tuck mulch. 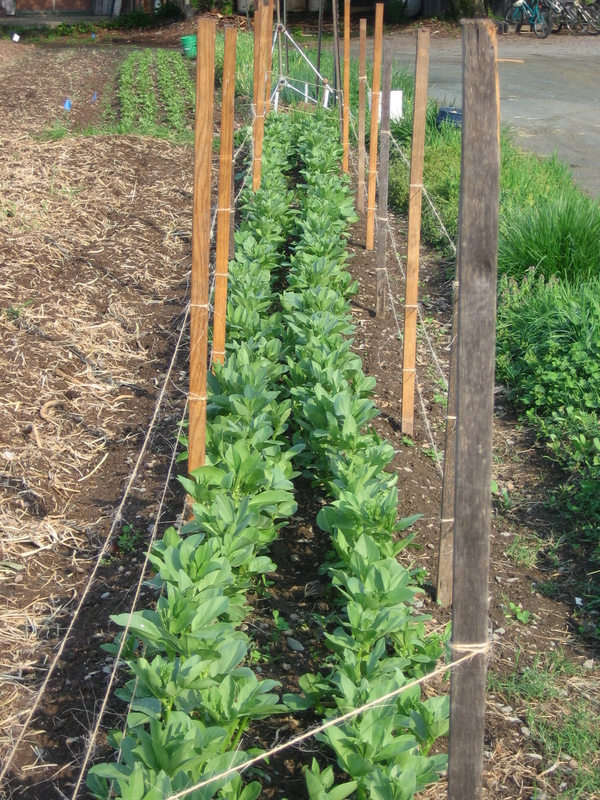 Set up posts and string weave the tomatoes, using thick baler twine for lower 3 rows. Really try to keep up with weekly string-weaving. String weave 1 row around peppers, using short stakes. 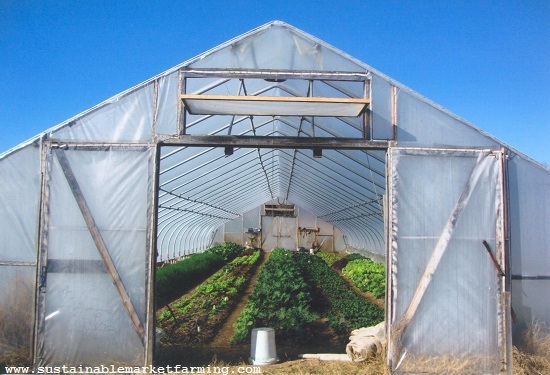 Clear empty coldframe and mulch with cardboard or plant something. Till each corn twice, undersowing at 2nd tilling (30 days), when 12” high, with soy for #1-5, oats/soy for #6. Thin corn to 8”. Avoid cultivating corn after it’s knee-high—roots are shallow. 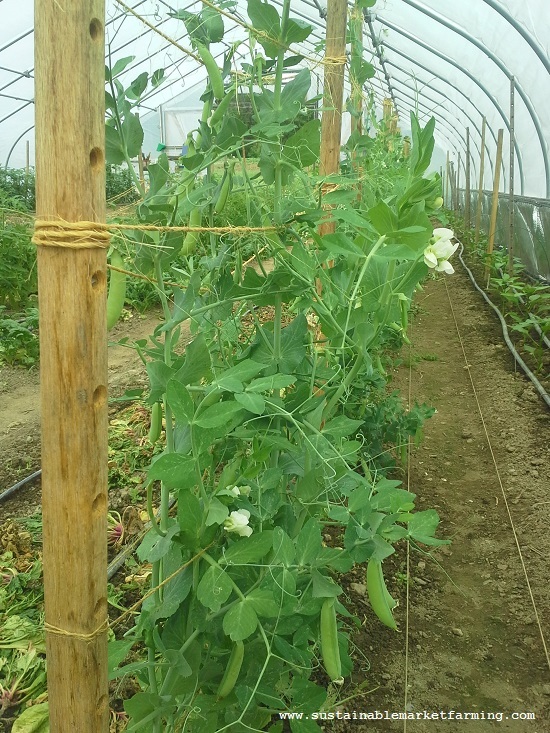 Sow corn #2, cowpeas #2; cukes #2 (picklers and slicers), summer squash & zukes #2 5/24 (or in greenhouse 5/14, transplant 6/7), watermelons #3, winter squash 5/26 (put woodash with seeds to deter squash vine borer). If squash sowing is late, don’t sow Tahitian butternut – slow. Cover cucurbits (perhaps not winter squash) against cucumber beetles. Max. cuke beetle population is mid-May; keep susceptible plants well-covered until flowering. Transplant lettuce #9, 10, 11; Roma paste tomato replacements for casualties, insectary flowers. 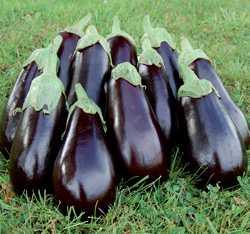 Fill gaps in eggplant, peppers, melons, watermelons. 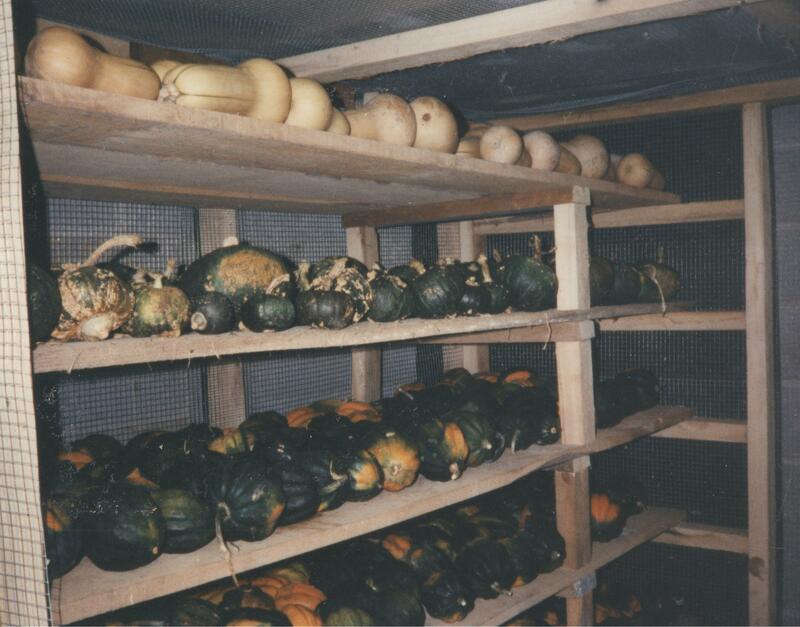 Store any seeds not needed until fall or next spring, in basement (radishes, onions, winter squash, watermelon). Harvest garlic when 6th leaf down is starting to brown on 50% of the crop (ie .5 green leaves, so that 5 skins cover cloves), or cut open horizontally- when air space is visible between. stem and cloves it’s time to harvest. [Could replant small cloves immediately for garlic scallions.] Allow 15 mins/bucket harvesting and 15 mins/bucket for hanging in netting in barn,. 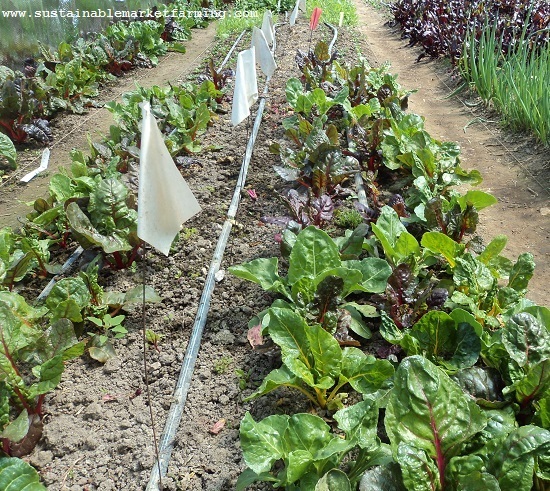 Till garlic area, sow soy & buckwheat to control weeds until fall carrot planting. 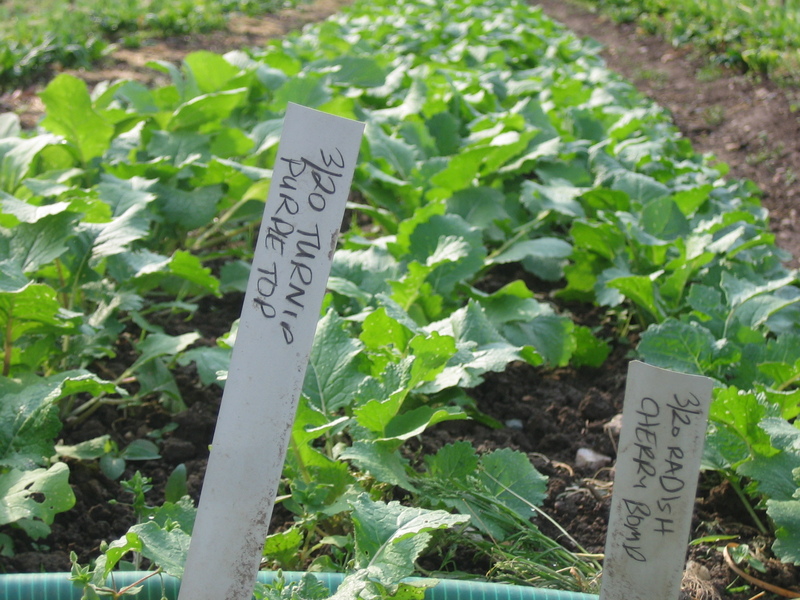 Plan fall and winter crops for raised beds. 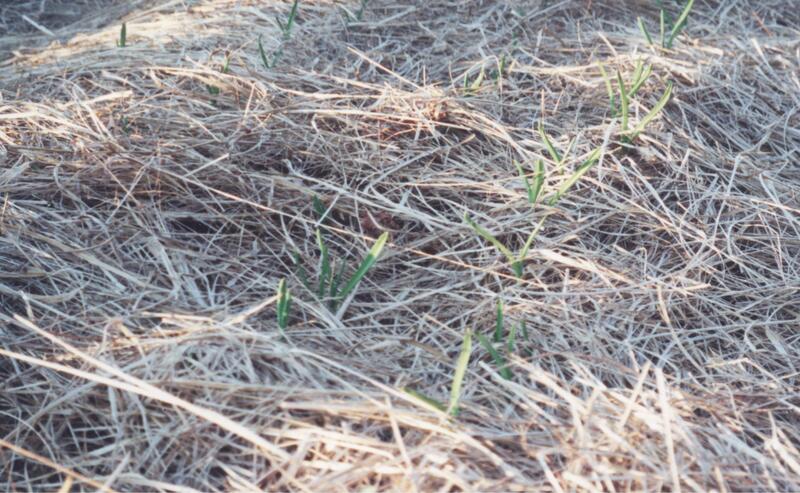 Cover crops: can sow buckwheat, soy, millet, and sorghum-sudan during May. Perennials: Put up blueberry netting before fruit sets. Weed & water & top up mulch. Mow grape & fall raspberry aisles. 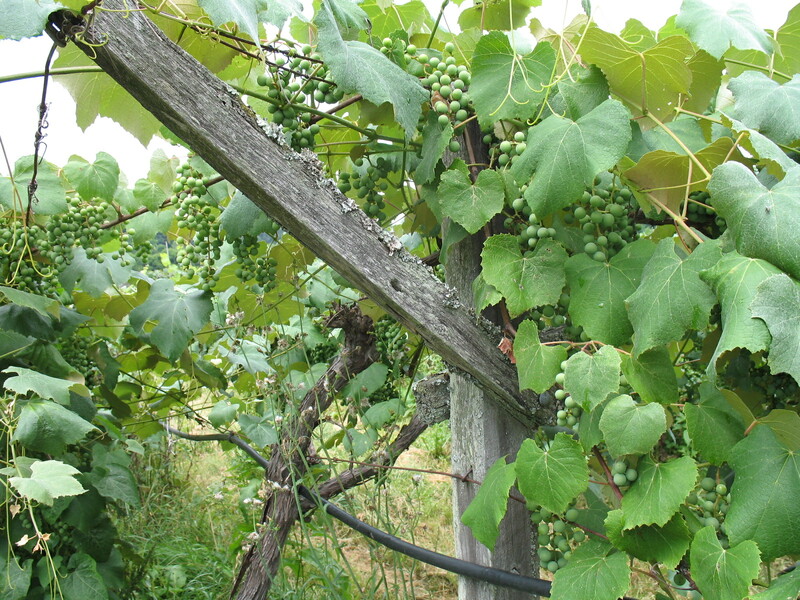 New grapevines: remove side branches and fruitlets. Weekly: visit grapes and log progress 4/20-5/30. If asparagus weeds are getting out of hand, mow down one or more rows to keep control. Our Concord grapes in late May. 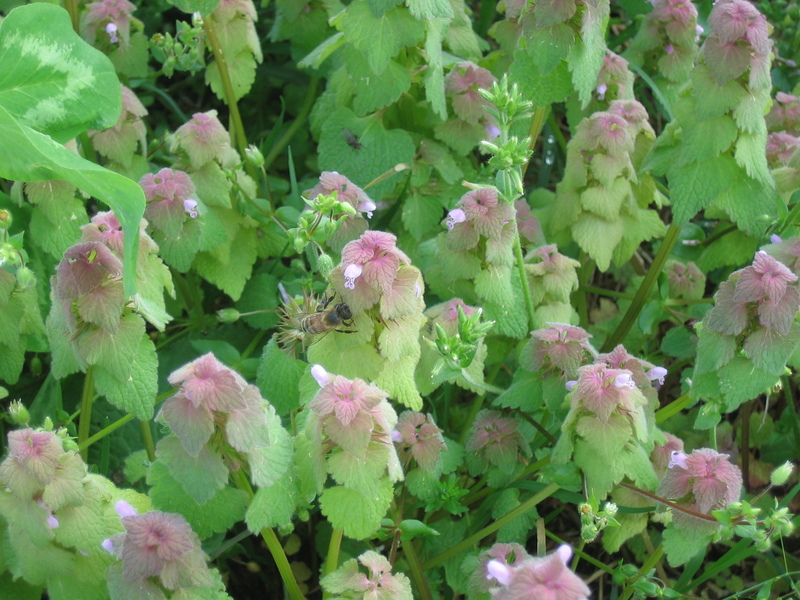 Flowering Purple (or Red) Dead Nettle, with honeybee. For ten years I have been keeping phenology records, as a guide to when to plant certain crops, and as a way of tracking how fast the season is progressing. Phenology involves tracking when certain wild and cultivated flowers bloom, seedlings emerge, or various insects are first seen. These natural events can substitute for Growing Degree Day calculations. Certain natural phenomena are related to the accumulated warmth of the season (rather than, say, the day-length), and by paying attention to nature’s calendar you will be in sync with actual conditions, which can vary from year to year, and are changing over a longer time-scale.. Many people know to sow sweet corn when oak leaves are the size of a squirrel’s ear. By this point, regardless of date, the season has warmed enough to get oak leaves to that size, which happens to be warm enough for sweet corn seed to germinate and grow well. Some people transplant eggplant, melons and peppers when irises bloom; sow fall brassicas when catalpas and mockoranges bloom; and know to look for squash vine borers laying eggs for the two weeks after chicory flowers. Some transplant tomatoes when the lily of the valley is in full bloom, or the daylilies start to bloom. When lilac is in full bloom, plant beans, squash, corn. Grasshopper eggs hatch. When lilac flowers fade, plant cucumbers. Also, recording the dates of the same biological events each year can show longer term climate changes. In Europe, 500 years of recorded dates of grape harvests provide information about summer temperatures during that time. Project Budburst is a citizen science field campaign to log leafing and flowering of native species of trees and flowers across the US each year. Each participant observes one or more species of plant for the whole season. Forsythia blooming 13-Mar 12-Mar 28-Mar 10-Mar 23-Mar 13-Mar 17-Mar 21-Mar 15-Mar 12-Mar 15-Mar Plant peas. Crabgrass germinates. 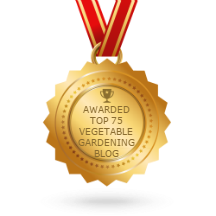 “Opinions vary a bit about how many years seeds of different vegetables are good for. The fuller story is that storage conditions make a big difference. You can make your own decisions, weighing up the information supplied, your knowledge of how carefully you stored the seeds, the information on each packet about percentage germination when you bought it, and the economic importance to you of that particular crop. If you always transplant lettuce, as I do, you can risk one of your four varieties in that sowing coming up poorly, and just plant out more of the other three if it fails. Many seed catalogs include information about seed longevity, and so does Nancy Bubel in The Seed Starters Handbook. Frank Tozer in The Organic Gardeners Handbook has a table including minimum, average, and maximum. 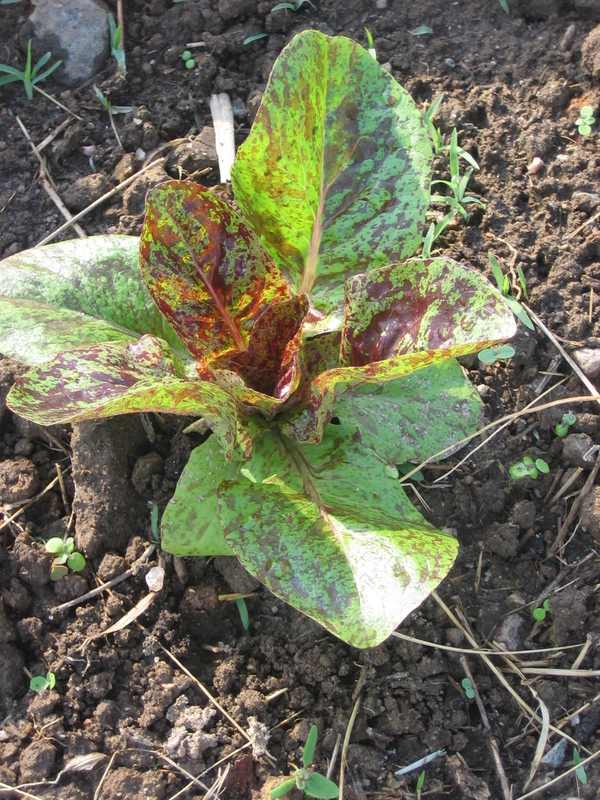 Rather than deteriorating with age, some very fresh seed has a dormancy that needs to be overcome by chilling (lettuce). Other seed contains compounds that inhibit germination. These can be flushed out by soaking in water for about an hour (beets). Another of the challenges with seed ordering is converting between grams, ounces and seed counts. Here’s a helpful table of 1000 Seed Weight for 13 crops. Our main seed suppliers are Fedco, Johnny’s and Southern Exposure. Fedco has great prices, especially on bulk sizes, great social and political commentary in the catalog, and no glossy pages. Johnnys has some good varieties that Fedco doesn’t, and a ton of useful information tucked away on their website. Southern Exposure is best on southern crops and heat tolerant varieties which we can’t expect seed companies in Maine to specialize in. Plus, SESE are my friends and neighbors. This year we are trying some new varieties. Generally we like to have some reliable workhorses that we know well, and trial a few new things, especially if we hear our favorite varieties are no longer available. Last year our Nadia eggplant couldn’t cope with the heat. For a while in early summer they didn’t grow at all – no new flowers, never mind new fruit. So next year, alongside Nadia I’m trying 3 that should deal better with heat. Florida Highbush is open-pollinated, from the Seed Savers Exchange. Epic and Traviata are hybrids from Osborne Seeds. I also bought some Sugar Flash snap peas from Osborne. We have been big fans of Sugar Ann, but I’ve heard Sugar Flash is even better on flavor, yield and harvest period. We’re going to find out! 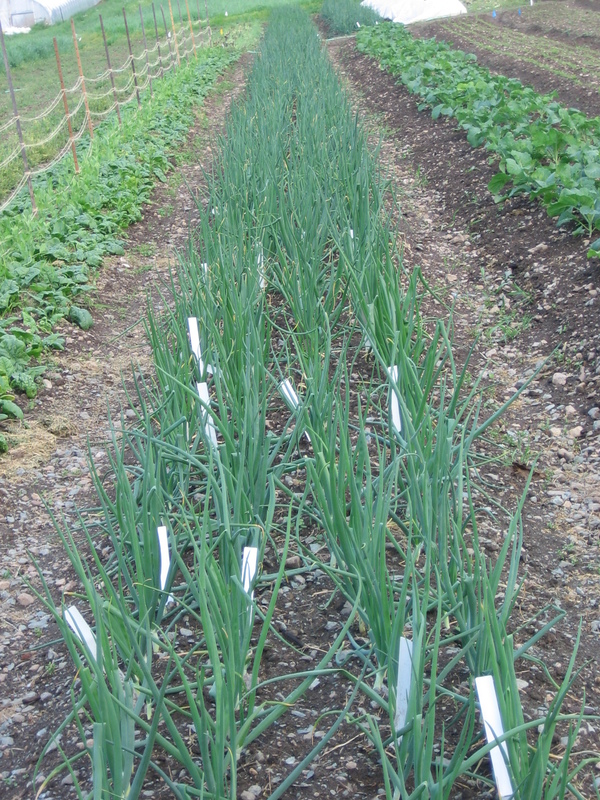 For a couple of years we really liked Frontier bulb onions as a storage variety for this climate and latitude (38N). Frontier disappeared from the catalogs of our usual suppliers and we tried Gunnison and Patterson. This year – no Gunnison! And we didn’t get a good test of Patterson last year, as we failed to weed our onions enough, after an initial enthusiastic good go at it. 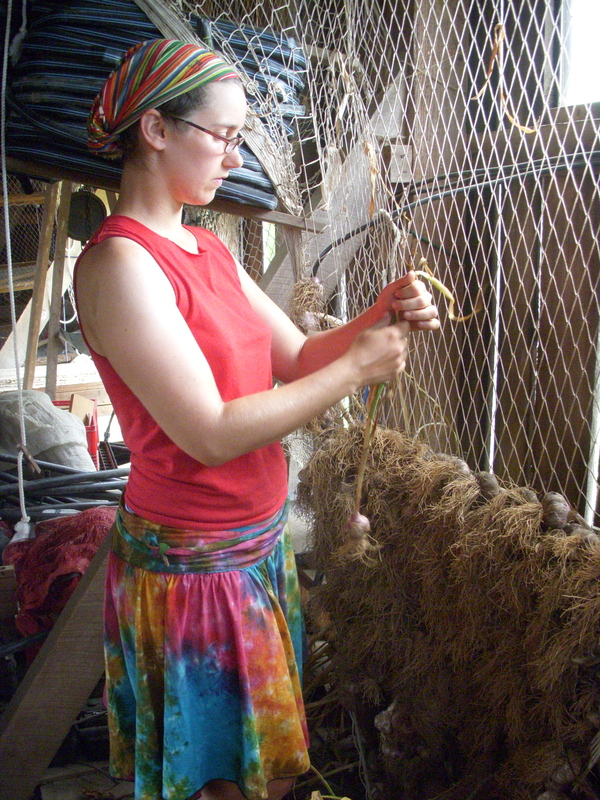 We were looking again at Copra, one we grew some years ago (before we found Frontier). I lucked out when I decided to see if Osborne had Gunnison, while I was shopping there. they didn’t, but they had Frontier! And then when I was shopping at Johnny’s, I found they did have some Gunnison for online sales only. So I ordered those too! We’re also trying Sparkler bicolor sweet corn from Fedco and a drying bean I won’t name, as the seed is in short supply. And this year we’re hoping Red Express cabbage will prove to be a reliable little worker. We used to like Super Red 80, but had several years of poor results. Since then, none of the other red cabbages we tried have satisfied us in terms of size, earliness, productivity and flavor. After a few years of poor pickling cucumbers, we’re going outside the box and trying West Indian Gherkins from Monticello, where they were grown by Thomas Jefferson (and some of the enslaved people, no doubt). These are not closely related to actual cucumbers, but are used similarly. I saw them growing in the Monticello garden when I was there for the Heritage Harvest Festival in September, and they are certainly robust and productive in hot humid weather. We’ll see how the pickles turn out! My only other “impulse buy” was the Salanova Lettuce new at Johnny’s. 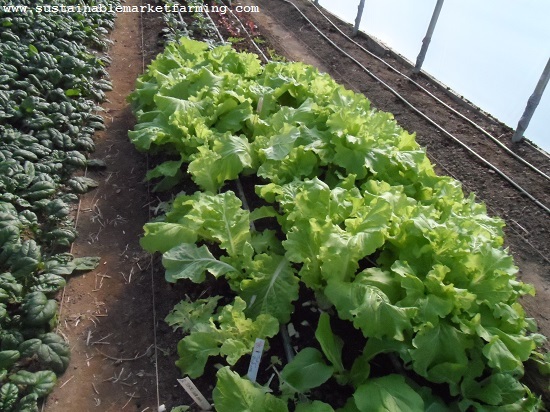 They are 6 varieties of head lettuce designed to be used for salad mix at a single cutting. Quicker than snipping rows of baby lettuce with scissors. More fun than plain lettuce heads. They are loose heads of small leaves in various shades of green and red, and two “hairstyles”: frizzy and wavy.